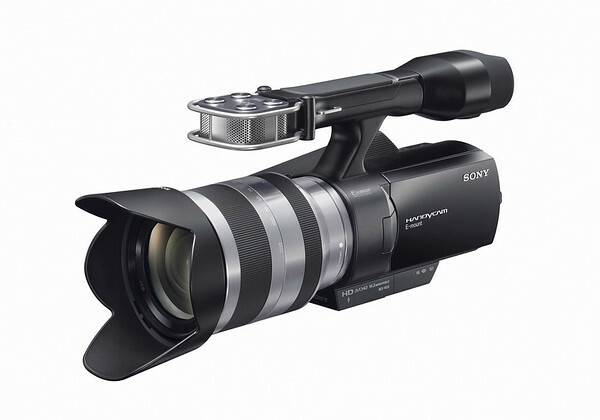 Sony’s NEX-VG10 Interchangeable Lens HD Handycam Camcorder is equipped with the same ExmorTM APS HD CMOS sensor used in the “NEX-5” and “NEX-3” digital cameras and compatible with the high grade “E-mount” series of smaller, lighter lenses optimized for video shooting with silent operation and AF. It is also compatible with a wealth of “A-mount” interchangeable lenses used by Sony’s existing alpha DSLR camera lineup via a mount adapter (sold separately), including award winning Sony G Lenses and Carl Zeiss branded lenses. Coupled with Sony’s powerful BIONZ processor, the camcorder’sExmorTM APS HD CMOS sensor realizes high resolution video and 14 megapixel still images. Approximately 19.5 times bigger than the standard sensor found in conventional camcorders, the APS HD CMOS sensor enables an extremely shallow depth of field. This allows videographers to achieve cinematic results with stunning background defocus (bokeh). Users can also enjoy DSLR-quality photo capture with features like Auto HDR, Handheld Twilight, and Anti Motion Blur, as well as catch fast action sequences with a continuous burst rate of up to seven fps. The NEX-VG10 can capture full 1920×1080 high definition video at up to 24Mbps for amazing clarity and detail, ideal for recording on to Blu-ray DiscTM media. It also comes with an E-mount 18-200mm lens optimized for video shooting that offers a powerful 11x optical zoom in addition to a silent auto-focus system and Optical SteadyshotTM image stabilization with Active Mode for superior versatility. Satisfying the needs of serious videographers, sound quality matches the stellar imaging performance of the NEX-VG10. Its Quad Capsule Spatial Array Stereo Microphone uses advanced processing algorithms to combine signals from four individual microphone capsules.The result is exceptionally clear stereo audio with high directional response, allowing videographers to capture more sound from their subject and less background noise. The camcorder also features dedicated inputs for optional external microphones and headphones to monitor sound levels. Dieses Video zeigt exklusiv die ersten Testbilder der NEX-VG10. Charles Michel, Kameramann und Mediacoach der Videoacademy präsentiert die Neuheiten und Features der neuen Sony Handycam. wow! cant wait to try it. WOWWW!! This is it…finally a videocam from Sony dslr line-up; I bet it beats all other APS-C dslr HD video quality. Nothing takes a video like a Sony Handycam. I’ll take a wait and see approach. No 24p. Also, my Canon HV20 blew my Sony AVCHD camera out of the water indoors in a low light situation. Most Sony camcorders have a ‘video look’ to them which is cheap and embarassing. I have high hopes for this camera but I’ll wait for more and better footage from to hit the web. The Bali scenes were not that impressive at all. Did they pay these people to film that stuff? I could have shot similar stuff with my HV. The VG10 is groundbreaking in price and format but we shall see more what it’s actually capable of once in capable hands.